“Now I know why girls need sports bras,” Caitlyn Jenner quipped during a friendly tennis match shown on her new docu-series Sunday. The series premiere of I Am Cait, the new docu-series on E! about the life of Caitlyn Jenner (formerly known as Bruce Jenner) was an emotional roller coaster. We witnessed everything from her daughter Kylie seeing her for the first time as Caitlyn, to Kanye West offering his support, to Jenner’s mom Esther admitting how difficult this transition has been for her. We also saw the former Olympian flex her muscle, and find new appreciation for a topic near-and-dear to our hearts: “Now I know why girls need sports bras,” she quipped during a game of tennis on Sunday’s episode. We hear you, Caitlyn! The right sports bra is a crucial part of a woman’s exercise arsenal, and your choice can totally make or break a workout. That's why we wanted to take this opportunity to recommend a few new bras we are super obsessed with right now. 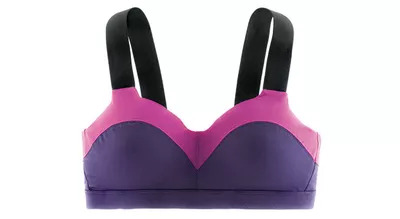 Perfect for A-cups, the New Balance Psych Tenderly Obsessive ($46, newbalance.com) is a hybrid of encapsulation and compression styles that brace breasts while limiting bounce. Plus mesh keeps you cool when temps heat up. Tackling an extra tough WOD (workout of the day)? 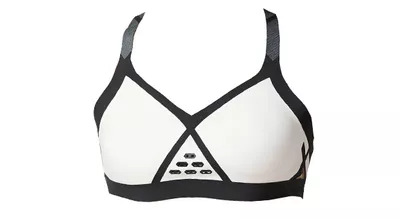 The UVP 50+ Reebok CrossFit Bra Built With Kevlar ($100, reebok.com) has strategically placed Kevlar—a synthetic fiber used as a reinforcing agent— along the straps for added durability. Perfect for those days you’re working on push presses, clean and jerks and back squats. The Moving Comfort Hot Shot ($42, brooksrunning.com) reins in your bosom without being constricting (read: so long sausage casing! ), so you can flow through yoga class with ease. And its pretty two-toned hue, which visually shapes breasts, is the perfect excuse to go sans shirt.